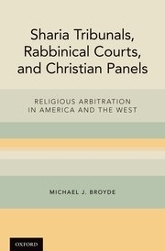 Michael Broyde, Professor of Law and CSLR Fellow, has a new book, Sharia Tribunals, Rabbinical Courts, and Christian Panels: Religious Arbitration in America and in the West, published by Oxford University Press. The book explores why religious people and communities increasingly turn to private faith-based dispute resolution to arbitrate their litigious disputes. It also examines why American law is so comfortable with faith-based arbitration. Broyde argues that secular societies should use secular legal frameworks to enforce religious arbitration. He also considers the proper procedural, jurisdictional, and contractual limits of arbitration, particularly religious arbitration. He focuses on whether secular societies should facilitate effective, legally enforceable religious dispute resolution.